Display the "phone/message settings" screen. Set adding the vehicle signature to outgoing messages on/off. Change the incoming sms/mms display. �Full screen�: when an sms/mms message is received, the incoming sms/mms display screen is displayed and can be operated on the screen. 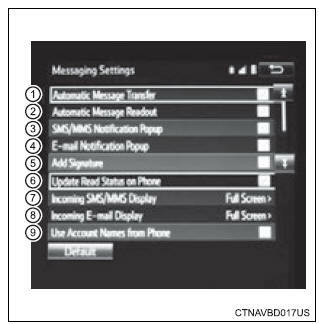 �Drop-down�: when an sms/mms message is received, a message is displayed on the upper side of the screen. �Full screen�: when an e-mail is received, the incoming e-mail display screen is the displayed and can be operated on the screen. �Drop-down�: when an e-mail is received, a message is displayed on the upper side of the screen.